This is one of Tim McGraw’s most polarizing singles, with perhaps more falling down on the “hate it” than the “love it” side of things. I love it. I really do. Part of that love is from a combination of the vivid imagery and McGraw’s plaintive vocal performance. But a much bigger part comes from the second verse where the narrator dreams about his father. Their relationship is idyllic in his subconscious but was distant and cold in reality. That verse is so well-crafted, and McGraw delivers it so masterfully that it always surprises me, no matter how many times I hear it. It’s amazing to see how far he came from “Don’t Take the Girl”, where you can hear the tragedy coming from three verses away, so dripped is his voice in cloying sentimentality. After all , there aren’t that many folks out there who get the perfect childhood and then go on to provide it to their children. Even those who have never known a broken home have usually known a few shattered windows. “Grown Men Don’t Cry” makes its fair share of eyes roll upward, but quite a few of those eyes prove the title wrong because it hits so close to home. I love this record so much. “Grown Men Don’t Cry” has never struck me as cloying in any way (though you sure hit the nail on the head with “Don’t Take the Girl”). The verses are so beautifully detailed, and everything about it just exhudes sincerity. I really took into account what this song was really about as my brain has always adapted it as three separate verses as opposed to three pieces of a larger whole. The line, “it feels more like a guy who didn’t come from a loving home feeling the pain of the little boy and his mother, and later feeling deep appreciation for his own love being reflected in his little girl’s “I love you, Dad.” sums the song up perfectly. Fantastic analysis of a great song, Kevin. I’d add this post to the list of your best writings. This is a prime example why you’re a master at what you do. Set This Circus Down was probably the peak of McGraw’s career for me. It looked like he was going to take the genre in a more substantial direction and the fans would actually follow. Look at him now. While “Grown Men Don’t Cry” wasn’t my favorite song on the album, it was still miles ahead of a lot of the stuff on the radio at the time. Side note: the fact that “Telluride” was never released as a single was a shame. The fact that it had to be re-recorded by Josh Gracin to see a release was an insult. I admit to liking quite a few sappy songs – I never was the macho type. Some, e.g., Kathy Mattea’s “Where’ve You Been”, have the tears practically welling up in my eyes as I listen. I do really like “Grown Men Don’t Cry” and I haven’t heard it in quite a while. Turns out I don’t have it so I’ll add it to my i-Tunes “to buy” list. Agree w JPap about the shattered windows line. Love the verses of this song, and love how this review points out the subtle continuity between them. I just have never liked the chorus. It’s like the large-scale, societal commentary of “I don’t know why they say grown men don’t cry” pulls focus from the beautifully personal story (/stories) at play in the verses. 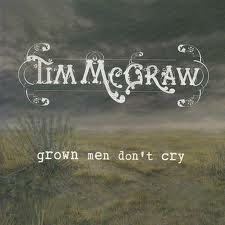 “Grown Men Don’t Cry” represents a watershed moment in mainstream country music, though I failed to find anyone in 2001 who quite believed me when I railed about it. It took me a few listens before I realized what the big deal was about this song, but eventually I caught it. It represents a paradigm shift in the presumptive audience of country music. Had this song been written a decade sooner, it would have been the mother living in the car with her son for whom we were meant to empathize. Instead, “Grown Men Don’t Cry” asks us to feel bad for the middle-class guy living in a nice home with a happy family and driving a Suburban (as much an eye-rolling selection of vehicle as could have been found). We’re supposed to feel bad that this guy had to encounter someone who was less fortunate than him. It’s a shame, because I absolutely love the Set This Circus Down album. It was the first time Tim McGraw released anything that I was interested in enough to buy; I never really cared for his music outside a handful of singles. I was captivated by that cover art, though, and eventually one day I splurged and bought the CD. I loved it, outside this one song. In the context of the album, I find it more palatable than on its own. Something about the sequencing or the way the other songs all cover other slices of life, maybe. Since then, though, there’s been little question that mainstream country music is no longer targeting the homeless moms living in their cars with their sons. It’s targeting the middle-class suburbanites who’d just as soon not sully their afternoon with a chance encounter with the less fortunate. The “empathy” from contemporary country music is so vapid and condescending that I cannot even stomach it, and I continue to point to “Grown Men Don’t Cry” as the flashpoint. The listener is meant to join the narrator in empathizing with the woman and her son, and likewise gain the greater perspective that comes with it. @Travis: You said “We’re supposed to feel bad that this guy had to encounter someone who was less fortunate than him”. I doubt that’s the intent here. I agree that the focus of the song is not on the unfortunate mother and her child. The chorus constantly repeating “I don’t know why they say grown men don’t cry” ties in to each verse since all 3 describe situations that could make a person cry, tears of sadness for the first two and joy for the last. The message here appears to be that it’s ok for a man to display emotion, not that we should feel sorry for the narrator. The man had been feeling sorry for himself until he saw someone less fortunate. That’s a wake-up call most of us need on occasion. Travis, you always make me think. (I check your blog every few weeks but don’t comment because of the difficulty a low tech guy like me has in figuring out the responding options. My last comment was as anonymous.) Looking at the lyrics with a more critical eye after reading your thoughts, I can see a problem with the first verse. The 4th line is “Years of bad decisions runnin’ down her face”, a rather presumptuous comment. It could easily have been years of bad luck – death of her husband, loss of job and health coverage, etc. By calling it “bad decisions”, it’s easier to just walk away. It was her fault. Blame the victim to ease your conscience. Most of us would probably feel bad but not do anything. Help will trickle down some day. The mother and her boy would have been lucky if they had been spotted by one of the “nuns on the bus”. Some to assuage their guilt for not personally doing anything choose to contribute to organizations and support programs that help the less fortunate. You also said that “had this song been written a decade sooner, it would have been the mother living in the car with her son for whom we were meant to empathize”. There was such a song in 1992 on Hal Ketchum’s “Sure Love” album, “Daddy’s Oldsmobile”. Written by Ketchum & David Mallett, it was not chosen for release as a single. The song is told from his point of view, and follows him through his “upsetting” day, with the woman and her son reduced to little more than a plot device rather than even being characters within the song. In days previous, that song would have been about the mother. Instead, it was about the well-off suburbanite who found it upsetting to encounter things in the course of his day that were incongruous with the tidy little bubble he’s trying to live in. I get that the thesis is supposed to be about how it’s okay for men to feel emotions and show them, but the example of seeing the mother and son was entirely different from what might have been chosen for a mainstream country song prior to “Grown Men Don’t Cry.” If Hag had written it, it would have been told from the perspective of a father living in a car with his kid. Instead, country’s target demographic had shifted to being the very suburbanites represented by the narrator. This song was meant to make soccer moms mushy when they heard it in their minivans on their way back from practice. @Bob – Thanks for the kind words! Sometimes my blog commenting system is all wonky for reasons I still don’t understand, so it may not be you! I had many of those same problems back when I was using Blogger for my site, so I think it’s pretty common with that particular hosting service. I ended up switching to WordPress, which was a headache of a process, but that fixed the commenting issues. @Travis: While I am glad that your comments are so in depth it seems as though you are adding things to the song that were never there. The lyrics of the song never really even hints that the man is some suburbanite (a word I will be using more often now!) besides the fact the he does have a suburban vehicle he gets into. The rest of the lyrics talk about how he had a distant relationship with his father and how he adores his daughter. I guess I just always looked at the song from the point of view that when the narrator is seeing the mother/son he wants to tell them it will be okay because he and his mom were in that similar situation when he was a child. This can be further explained why his relationship with his father was described as distant because “he was a slave to his job and couldn’t be around”. I know the song can be looked at from many points of view. The only thing I guess I have a hard time understanding is how this song showed some kind of shift in demographics for country music. In addition to driving off in his Suburban (and I don’t believe that make was selected arbitrarily), I’ll point to the final verse. Our narrator lives in a home with an upstairs level. Of course, plenty of farmhouses also have an upstairs and sure, plenty of rural folk read bedtime stories to their kids, too. But are these really details that smack of old school country lyrics? The moral here is that his father was too preoccupied with making money to spend his time with his family. In the third verse it’s clear that our narrator has decided his family is more important to him. Nothing specifically suburban there, but our narrator is doing well enough with his Suburban and upstairs home that he feels he can afford to concentrate on his little girl instead of losing those years in pursuit of the almighty dollar the way his dad did. These are, of course, entirely arguable interpretations over a few specific word choices and I readily concede that. I still point to the fact that this song’s most gripping element – the woman and son living in their car – is reduced to being mere backdrop for this guy’s bad day. It’s a complete role reversal from what country music used to be about, because as I’ve said before, in an earlier time, this song would have been about that woman and her son instead of the guy who drives away to his nice life. What more perfect microcosm than a song about a guy with what amounts to a nice life being bummed out seeing someone living in her car with her son and then having some kind of spiritual epiphany about gratitude for having that nice life? as I’ve said before, in an earlier time, this song would have been about that woman and her son instead of the guy who drives away to his nice life. If the song were about the woman and her son, it would have shifted the song’s focus and overall theme to the point that it would be an entirely different song. It wouldn’t be “Grown Men Don’t Cry,” and it wouldn’t address the same objectives that this song does. Considering the narrator’s perspective, I don’t think there would have been any effective way to develop the mother and son as characters. After all, they’re complete strangers whom the narrator has only a brief encounter with. But does that really mean that it’s not worth telling the narrator’s side of things, and how he was moved by the encounter? I think there are many of us who have been affected in one way or another by observing someone living in trying circumstances, and I think that’s perfectly worthwhile subject matter for a song to consider. I don’t think the fact that his home has an upstairs in significant at all. There are lots of households of widely varying class levels in which the homes have upstairs levels. More importantly, is it somehow wrong for this narrator to express thankfulness that he has a roof over his head, food to eat, and a loving family? Those are things that many would sooner take for granted. There have been many songs in recent years about how thankful someone is for all the blessings in their life, and I think this song expresses such thanks with a great deal more depth, genuineness, and sincerity than most.